Not even an hour after I wrote my last post, I ended up meeting some other tour group members! They were already here at the guesthouse since they travelled down from Ecuador together. It couldn’t have worked out better really as I am still even now in slight zombie mode. I think I’m more jetlagged than I expected – woke up at 3 and couldn’t get back to sleep. We’ve a long bus journey today though so hopefully I can catch up on sleep then! Anyway, some of the group had planned a day which I gratefully joined in on. We went into Central Lima with the purpose of seeing the catacombs, but since we were there I was able to catch some quick glances of the magnificent architecture. It was something like 30-40 minutes bus ride from our more bohemian district so that should give an idea of how big the city is and there’s no way I would have worked it out alone in one day! Then lunch in Lima’s famous Chinatown and later to the coastal area of Miraflores. I wish I’d taken more photos on my phone but mostly used my camera so this one by the coast will have to do. We had dinner at Roky’s, a casual chicken place which is a family favourite in Peru. It was like Nandos but much bigger portions and roughly £3 for the whole thing! It was great to meet the group and hear about what everyone’s up to. It seems like there’s a good atmosphere and a ‘stick together’ mentality so I’m excited to travel with them for the next 21 days! Today I’ll revisit Miraflores in the morning for a better look around with the people who arrived yesterday so didn’t see it (and I was only there an hour). Then a bus down to Paracas, where we have lots of exciting activities lined up for the next few days. Including island visits and pisco tasting!! Lima has surprised me. I’d heard it was dirty and big to put it bluntly. And yes, it’s vast and sprawling, uncontainable and intimidating. But it also has a lot of character and the four areas I briefly saw (Barranco, Miraflores, historic centre and Chinatown) could have been different cities, even countries. 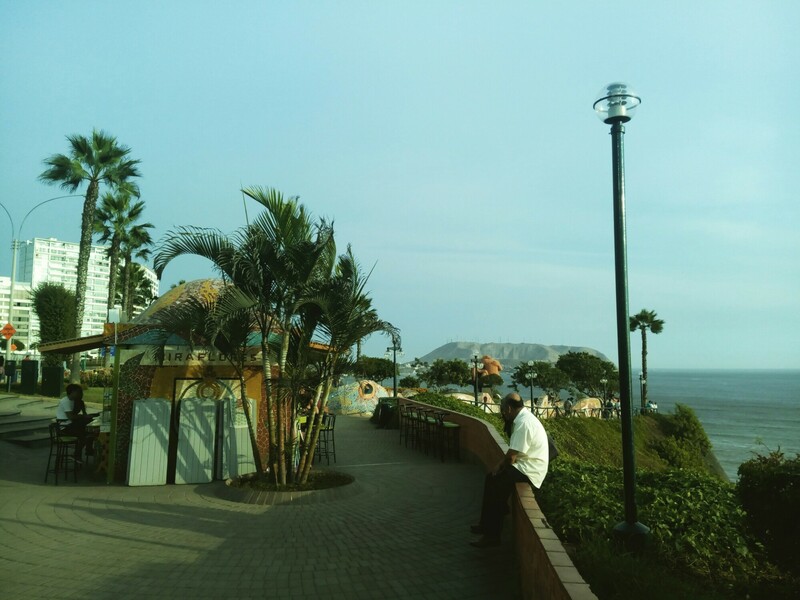 Barranco is shabby but lively and colourful with plenty of bars; Miraflores had beach resort, even Californian, vibes; and the centre would not have been out of place in a European city of splendour like Prague! I’m not sure it’s worth more than a couple of days here though. First of all you don’t come to Peru to see just Lima! Secondly, underlying all of this I was very aware of my belongings the whole time and found it hard to relax 100% because you are aware it’s a huge mass of a place which knows poverty, corruption and unstable roots. Speaking of which, we met our guide Fredy in the evening. I like him a lot! He told us all sorts of interesting facts and linked them all up so they were all relevant. My favourite kinds of facts! For example there is severe flooding in the North at the moment, and he explained about the geography behind why Peru is having so much rain currently (it’s all to do with the El Niño climatic phenomenon, which I may or may not explain further if I get time but otherwise worth a Google!). But he also told us that during the reign of terror of terrorist groups like the Shining Path in the 80s and 90s, where rural communities were attacked and targeted, people were so fearful that there was an incredible level of mass migration to Lima. That explains its size (a third of the country’s population, remember) but also why there are such problems with floods! The sudden mass migration meant that the infrastructure couldn’t be properly planned so they were building straight onto the desert area north of Lima and in dry rivers, meaning it is basically a flood zone waiting to happen. In a way, that story sums up a bit the feeling I am already starting to have about Peru. It seems like its geography, history and culture are intertwined in a way that I’ve never seen before and it is so interesting to me. Roll on the next 3 weeks!